Bureau for Chemical Engineering TB-Klade » What information is needed to calculate the origin of products? What information is needed to calculate the origin of products? The LCOA is suitable for the optimisation as well as for the communication of the origin of products. Producers may use the results in-house to raise the regional share or to optimize intermediate products along the supply chain (B2B). Dissemination via packaging, advertising or the internet may help to inform consumers (B2C). To ensure that the details of the LCOA are consistent and sufficient for the purpose of the study, the client should clearly name the goal. 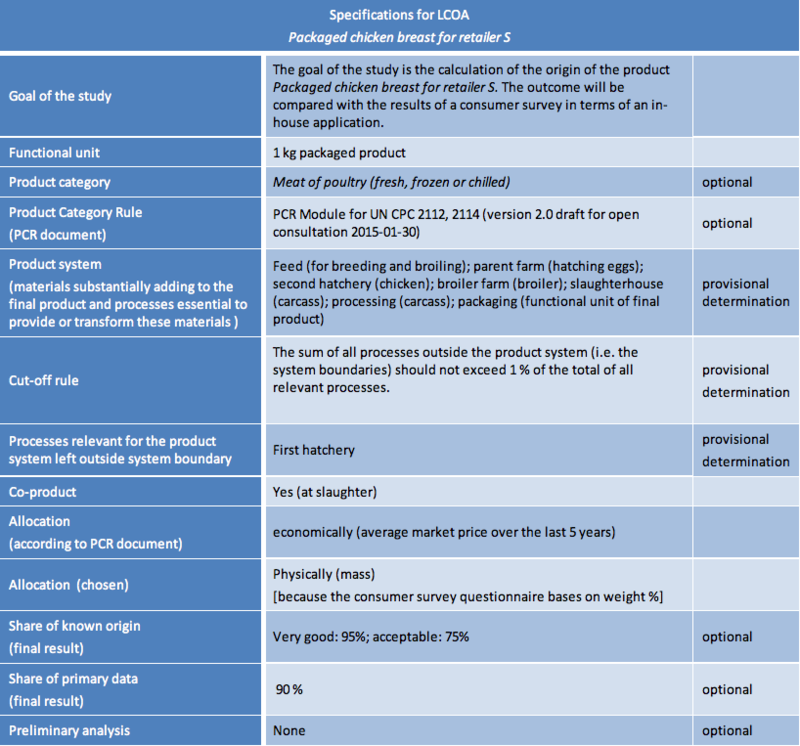 A unit of comparison for the investigated product is an important normative requirement of the Life Cycle Assessment (LCA) and is overtaken by the LCOA. The functional or declared unit forms the reference, to which raw materials, intermediate products and processing are related. If the results are used for product comparisons, then the product group and the corresponding product category rule (PCR) should be identified and investigated. To identify the accurate product group different systems of product classification are available (e.g. UN CPC; http://unstats.un.org). The correct definition of the product group is a prerequisite for a type III environmental declaration (environmental product declaration, EPD). An EPD is an instrument for the producer to communicate the environmental performance of his product. With EPDs comparative assertions between competing products become possible whereby the basis of the assertion constitutes a Life Cycle Assessment (LCA). EPDs are managed by program operators (e.g. The International EPD® System; http://www.environdec.com). The operators offer product category rules (PCRs) as a guidance for the preparation of an EPD. A PCR document contains specific instructions for the compilation of processes along the supply chain. The LCOA covers all processes which appear in the life cycle of a product except the use phase and the end-of-life phase (e.g. waste disposal). The total of all relevant processes for the manufacturing of the product constitutes the product system. The admissibility to exclude a relevant process from the product system and leave it outside the system boundary is decided by a cut-off rule. An indicative cut-off value in the LCOA is as follows: The sum of all processes outside the product system (i.e. the system boundaries) should not exceed 1 % of the total of all relevant processes. After completion of the LCOA it has to be critically reviewed that disregarded processes do not compromise the validity of result. Beside the product all co-products suitable for human consumption form a useable output of the product system. Dealing with co-products in LCOA is widely congruent with LCA and EPD practice. When co-products exist then LCA methodology demands a partitioning of the turnover of upstream processes to product and co-products – a procedure which is called allocation. If not already done at the definition of the functional unit then at least at the allocation it has to be decided if the turnover of the processes is either specified as mass (physically) or as market price (economically). Further specifications can be made in respect to the product system and the final result: A threshold value can be defined for the share of known origin. And it can be stipulated that a dissemination of the final result depends on the exceeding of such a value. A further specification in terms of data quality may be the share of primary data. Primary data are provided by the producer himself or from the supply chain. They are specific for the investigated product while secondary (generic) data stem from literature or data bases and substitute primary data. The share of primary data can therefore be interpreted as an indicator for data quality. Before starting a detailed LCOA a checklist may be prepared to analyse both the availability of primary data from the producer or from suppliers and the availability of generic data from literature. Such a preliminary analysis may be helpful to appraise if the detailed analysis will provide a valid result. All processes starting with raw materials up to the final product are inventoried. 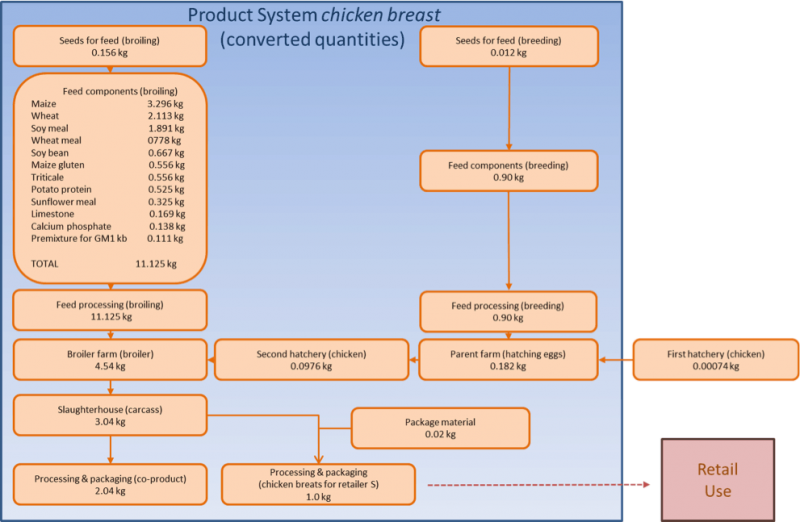 For the product system chicken breast these are feed cultivation and feed processing, parent farm, hatching, broiling, slaughtering, processing and packaging (figure 1). The inventory is limited to materials which substantially add to the final product and to processes which are essential to provide or transform these materials. Because LCOA is restricted to product origin resource depletion and environmental impacts are out of scope. Consequently the inventory disregards all types of waste, emissions and energy as well as transport, infrastructure and auxiliary materials (e.g. solvents, cleansers or disinfectants). The product system sketched in table 1 has to be elaborated in detail and – going back from the final product – the processes have to be related to each other. This means that the demand of the downstream process determines the required output of the upstream process while the functional unit of the product determines the absolute quantity. Figure 1 shows the inventory in mass quantities (kg), alternatively market prices (€/kg) could also be applied. At slaughter the investigated product 1.0 kg of chicken breast and additional 2.04 kg of co-product is generated. According to the general rules for allocation the turnover of all upstream processes – this concerns all processes preceding the process Slaughterhouse – have to be divided between the product and the co-product at a ratio of 1 to 2.04. However this does not apply to downstream processes such as Package material which accounts for 100 percent to chicken breast. The process First hatchery (chicken) in figure 1 is set outside the system boundary and does not contribute to the product system. For such a setting the fulfilment of the cut-off rule has to be checked at least after the final result is known. Figure 2 shows the geographical specifications of the product system reaching from small villages, districts, provinces to countries and to even larger units. The geographical specifications given are named geographical units. Since very small, poorly defined or widely unknown locations respectively regions of origin would make it difficult to communicate the results of the analysis it is advisable to search for better known and well defined alternatives. As a rule political and administrative units such as districts, provinces, nation states or the EU are suitable for that. Figure 3 shows alternatives for small and unknown geographical units: The process Second hatchery respectively Slaughterhouse is located in the village Lasnitzhöhe respectively Gniebing. Therefore the district Graz-surrounding respectively Southeast Styria or even the province Styria seems to be a better alternative. The smaller geographical unit – in this case the districts – may better elaborate the local or regional share of the product. According to the producer the origin of the process Feed components (broiling) Maize is located in the Austrian provinces Burgenland and Lower Austria. With respect to the presentation of the final outcome the use of the next larger political and administrative unit Austria would be more convenient and understandable than an aggregation of two provinces. If the geographical unit is principally known but brings little gain in information or complicates the presentation of the final result, then the default unit Global can be used. A typical application for that would be the process Packaging material with the complex geographical information Austria/Germany/Italy gathered from the producer. Processes which are unknown in their origin are collected in the default unit Unknown. The unknown share of origin can therefore be calculated and constitutes an important information for product optimisation and product communication. As soon as a set of (provisional) geographical units is fixed a spreadsheet can be compiled which – for each process separately – quotes the inventoried mass quantities (kg) or – alternatively – market prices (€/kg) and allocates them to the geographical unit. After summing up the geographical unit’s share of origin is calculated (row 13 in table 2). The share of origin is that proportion of the supply chain expressed in percent which can be assigned to a given geographical unit (i.e. area). 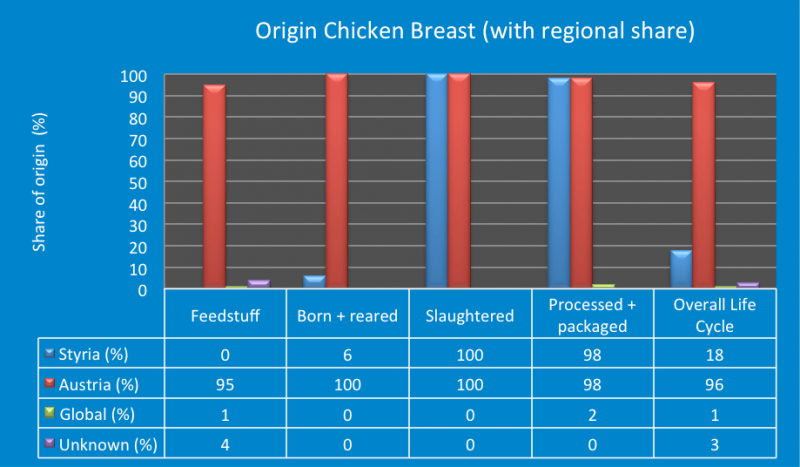 Table 2 depicts the complete origin information about the product chicken breast. The processes are assigned to two districts, three provinces, two aggregations of provinces and two national states. Additionally the default units Global and Unknown are provided. Table 2 contains the result of the LCOA of the chicken breast in detail. This presentation may be appropriate for in-house purposes but to complex and confusing to communicate it to consumers or stakeholders. For simplification the geographical units as well as the processes can be further integrated respectively aggregated. So the districts can be integrated into the provinces and the provinces into the geographical unit Austria. Through this procedure the final presentation however loses regional resolution. Also processes can be condensed, whereby the aggregates should form meaningful entities. So for instance the processes 1 to 6 inclusive can be aggregated to Feedstuff and the processes 7, 8 and 9 to Born + reared, while processes 10 (Slaughtered) and 11 (Processed + packaged) remain separate. Geographical unit’s share of origin can be graphically processed to point out the regional or national share (figure 5). Once the analysis is implemented a critical review should examine if the study meets the specifications made at the beginning and if the used data are reliable. The latter affords a quality appraisal of the data provided by the producer or applicator and of the data gathered from literature. If it is intended to disseminate the results to stakeholders the review should be done by a third party. Such a review should include a sensitivity analysis and a consistency check according to LCA standards. The conclusions, limitations and recommendations should be compiled in a report which additionally includes a complete description of the product system, data, specifications and the final outcome of the LCOA.